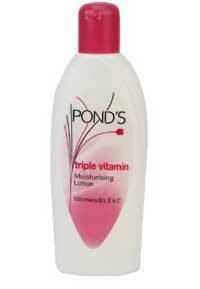 Buy Ponds Triple Vitamin Moisturising Lotion, 300ml with lowest online price ever. This is the body lotion product from Pond’s which you can get at just Rs. 148 while the actual price of this product is Rs. 200 but due to offer you can get this at just Rs. 148 which means you save Rs. 52 (26% Off) at this product. Check your delivery status using your area pincode for faster delivery. You can get this product through cash on delivery. Shipping charges may be applicable on this product because it’s not more than 499 so can’t get free delivery for this product. This product is fulfilled by Amazon India. It comes with fragrance along with soft texture. Radiance to your skin, offer a creamy touch to your soft and sensitive skin and soft texture that brings glow on your skin. Use this Pond’s product and offer a creamy touch to your sensitive and soft skin. Try this body lotion which is the most effective Ponds Triple Vitamin Moisturizing Lotion. A perfect blend of skin benefiting vitamins B3, E and C, which nourishes and softens the dry and chapped skin. It gives the feel of pleasant fragrance along with soft texture that brings glow and radiance to your skin, thereby makes it smoother. It gets absorbed quickly and leaves no greasiness behind. It is one of the nicest products from Pond’s. To get this offer please follow the below given steps.